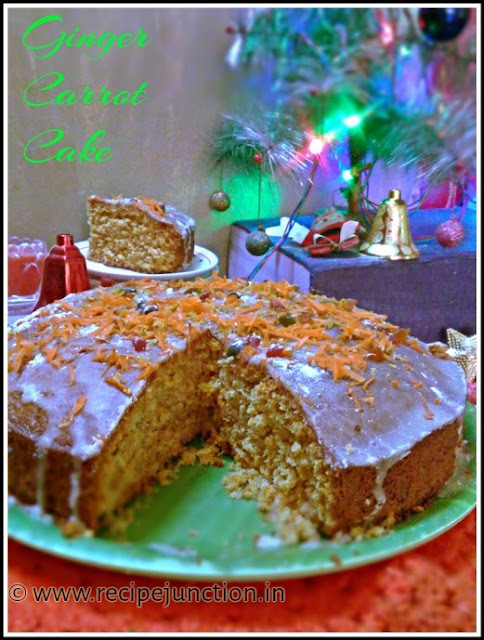 December comes and the baking bug inside me start to bite. 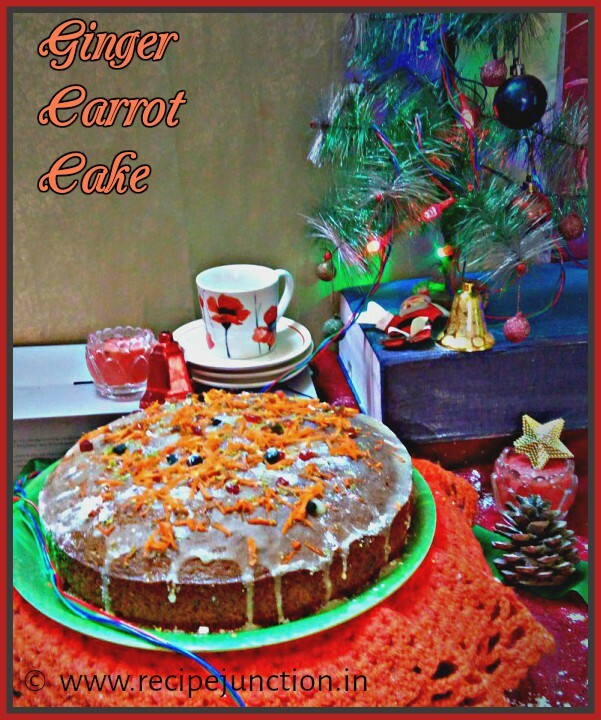 Though I bake quite often whole year long but in December my mind is always thinking about some cakes or cookies. I think baking is in the air in this month and all the delicious posts on the web attracts me more towards baking. 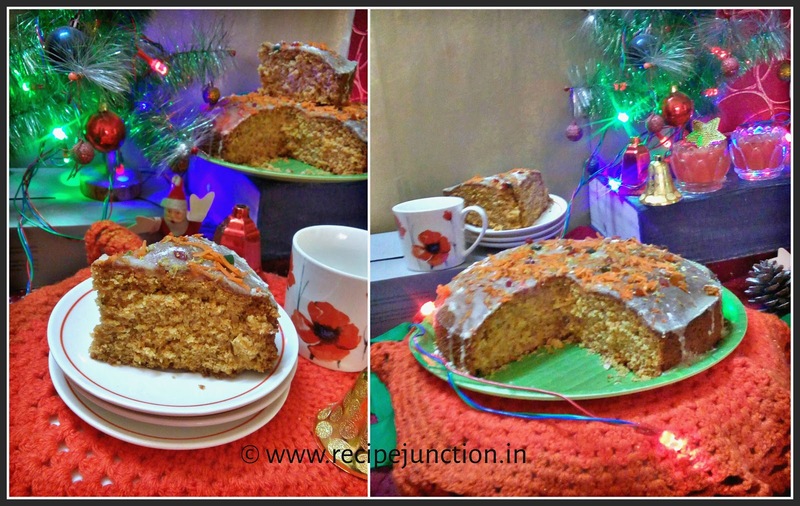 So this week again just before Christmas, I baked a Ginger-carrot cake for my family. It was a delight to devour with tea or coffee. Baking soda(sodium bi-carbonate) : 1/2 tsp. All-spice Powder : 1 tsp. or Nutmeg powder : 1 tsp. Preheat oven to 180 degree C. Grease your baking pan with butter and dust with little flour. Throw the excess flour from the baking pan. Mix the flour, baking powder, baking soda and salt. Sieve and keep aside. Add nuts and mix. Keep aside. In a medium bowl, beat butter and sugar till creamy. Add oil and eggs, one at a time and beat to mix. Beat in medium speed. Add grated carrot, ginger and vanilla essence in there. Mix together. Now add the flour mixture little at a time into the wet batter or butter-sugar mixture. If needed add little milk to make a soft and creamy batter. Lastly, add spice-powder or nutmeg powder whatever handy to you into the batter. Mix and pour the batter into the prepared baking pan. Put the pan in the middle rack of your oven bake for 45-50 minutes or until a wooden tooth-pick inserted in the center of the cake comes out clean. When done, remove from oven and let it cool for at least 6-8 hours or overnight. This cake taste much better in next day. 1) Like most ginger cakes, this will mellow and improve over a couple of days. 2) I will recommend brown sugar for this cake rather than white sugar. 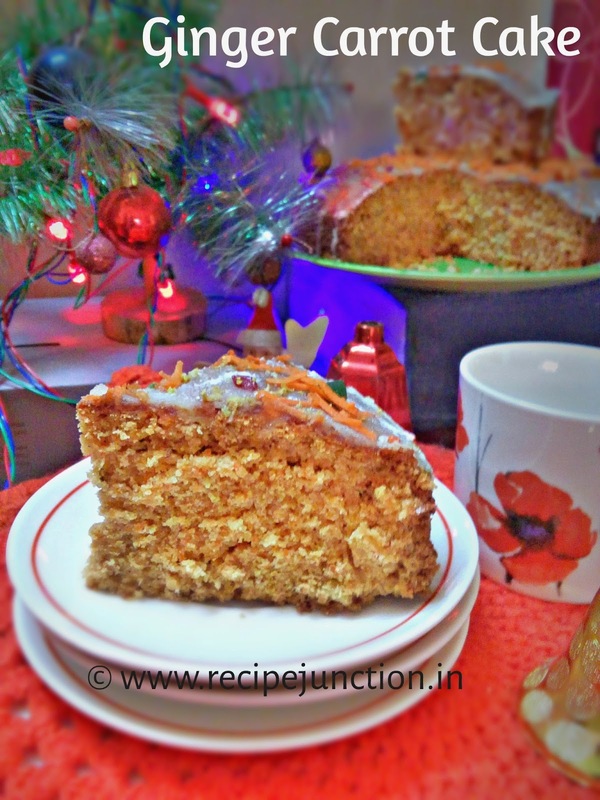 3) Do not omit the oil, oil gives this cake a nice and soft texture. Use more oil than butter/margarine. Hope to blog once more before 2018 but I can't, Wishing MERRY CHRISTMAS & HAPPY NEW YEAR to all who are visiting my blog and to all my blog readers abd blog followers. Stay Happy & Healthy.